Hi folks ok couple of weeks ago Andrew from North London Ridez came to me with an idea. The idea is now reality. The idea is as follows and has now progressed as explained below. To hold a legal cruise invite all that attend to bring a childs toy along.The Girls a girls toy the boys one for the boys.These toys to be collected and handed over to be passed the the children within the Armed Forces who are about to spend there first Christmas without a family member who has been killed in action. Andrew my freind contacted me because he knew I am Exforces and might know which people to contact.Since then we have contacted the Red Arrows Trust who in turn contacted the Forces Childrens Trust and the Denny Wise Organisation.They all love the idea and now we are working with us to pull this off.Today Tesco's at Great Central Way,Wilsdon London NW10 just off the A406 next to Ikea have agreed to allow us all to host the event on Saturday 5th December 2009. Mr Brain Wallece from the Red Arrows Trust is sending an email to Max Clifford.The Event will start at about 5pm and finish About 11pm.I personaly have aranged in Peterborough were I live a collection point for toys to be brought to by the public of Peterborough who wish to donate and Thrifty Hire Peterborough have donated a Hire van to transport the toys to the event. We shall be holding at this event competitions for 1.The Best in show car or Truck. I have tonight emailed the Mayor of London inviting him to attend this event. Also spoke to Sue Marchant from BBC radio Cambridgeshire who will be interviewng Andrew and Myself on the radio. I will be contacting other Radio Stations and BBC TV Look East and South East about this event. will update you all as more info comes in. thats a great idea. i'll be there and im pretty sure arron will be able to come as well. great flyer andrew well done. scared of the sheer size of the event and asked if we could move it to the sunday 6th december which was out of the question as the event was too far advanced to move it. she then said to my horror that then the event could not go ahead.......i then asked why and the reason she gave was that the "store would not be able to cope". i then found out that alexia was NOT a store manager NOT even a assistant store manager when in fact she was only the CUSTOMER SERVICES MANAGER!!!!!. you could not believe how i felt. i then found out the name of the REAL store manager PAUL was not told about this event even tho alexcia had taken upon herself to help advertise this event. the poor excuse TESCO gave to NOT let this go ahead was "THEY WOULD LOSE CUSTOM" on the day. to my disgust i said how can TESCO justify profit over our armed forces children. they said the 5th of december was their busyest day due to the public being paid at the end of the week and that they could NOT afford to lose the custom. they stated they have around 30,000 people go through their doors and holding this event on the 5th would cost them money and had to put ther custmors first. i then phoned head office to tell them of how disgusted i was with TESCO. the head office manager told me that it would be very damaging to tesco if they stopped this going ahead.....head office customer services told me it was up to ALL store managers to decide how their stores are run. but told me that this was a wrong move by the store manager and if they had the power they would have gone over his head and let this event go through due to the sensitive nature of this very important public event. i was even told from the sponsor and events department of TESCO that they do NOT write out contracts as it's up to the store managers to hold any kind of event. i feel i have been lead up the garden path by this ALEXCIA who was just a customer services manager and NEVER told her store manager anything about the TOYS FOR LITTLE HEROES event. i'm disgusted that TESCO has put profit and greed before our forces children. i have no alternative but to counsell this event. the toys i've collected will stay with me until i have found a way to get the toys to these children. anyone else who has toys to donate please can you drop these to the ace cafe london where i hold my meets every sunday from 7pm. i will be holding a mass cruise to support the armed forces children but will not be useing any stores to help me. i will be making another flyer with new details of the cruise named "CRUISE FOR LITTLE HEROES"
i would like to thank everyone who did confirm attendance for the 5th. all i have to say that TESCO are out of order and putting profit before our forces children is a utter disgrace. My name is Gary Sargeant and Brent Park is one of the stores I look after in North and East London. I understand from my colleges in the office and Brent Park that you would like to hold an event in Brent Parks car park on the 5th of December. Unfortunately due to the short notice of such a large event, we will not be able to help your charity on this occasion. I'm sure you will understand that such events require considerable organising and time to prepare. However should you wish to organise a collection at the store, we would be only to happy to assist. Please feel free to contact the store directly. I have tried to phone your mobile but have had difficulty in contacting you. Therefore I hope you do not mind me contacting you via E-mail. playing up all day long. the Armed Forces a small amount of Happyness at Christmas. Chairman for Wheels for Charty. 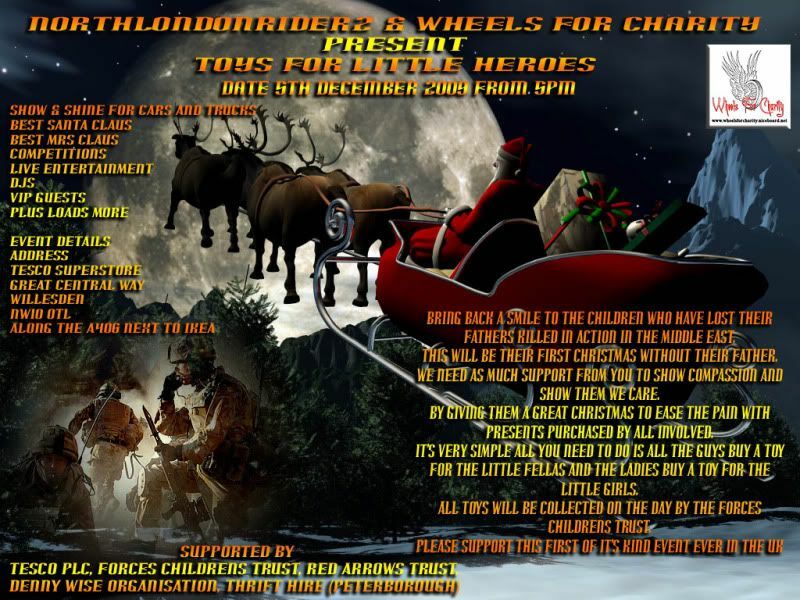 i cannot beleive this all the hard work etc that you all have done.sorry to hear the event is not going ahead.lets all hope that toys will be donated to the children at christmas they deserve these.to cancel at the last minute is an insult.looks like all tescos are interested in as making plenty of profit then help us. im so gutted and heartbroken it had to be cancelled. i didnt post a message straight after as this would be filled with asterixes as i was turning the air blue. thats what you get when dealing with big companies. theyre blinded by their own greed and if they had a heart and took a moment to think outside the box, they would let this event go ahead. i feel sorry for andrew and rupert who worked so hard to organise this event. really hope the kids get their presents in the end.